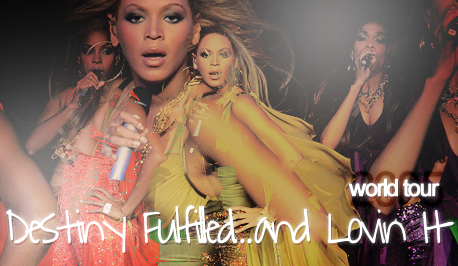 Destiny Fulfilled … And Lovin’ It Tour was a massive worldwide 2005 concert tour by the reunited American female R&B trio Destiny’s Child, that visited 16 countries throughout Australia, Japan, Middle East, Europe, and North America with 67 dates in total. The U.S. leg of the tour grossed approximately $70.8 million dollars according to Billboard magazine and was the highest-grossing tour for either a pop or R&B band since TLC’s FanMail Tour. Supporting acts on the North American leg of the tour included the likes of Keshia Chanté, Chris Brown, Amerie, Mario, Teairra Mari, and Tyra Bolling. During the last stop of their European tour in Barcelona on June 11, 2005, Kelly Rowland suddenly announced “This is the last time you would see us on stage as Destiny’s Child” meaning that the group was going to go their separate ways following the tour. We have been working together as Destiny’s Child since we were 9, and touring together since we were 14. After a lot of discussion and some deep soul searching, we realized that our current tour has given us the opportunity to leave Destiny’s Child on a high note, united in our friendship and filled with an overwhelming gratitude for our music, our fans, and each other. After all these wonderful years working together, we realized that now is the time to pursue our personal goals and solo efforts in earnest. … No matter what happens, we will always love each other as friends and sisters and will always support each other as artists. We want to thank all of our fans for their incredible love and support and hope to see you all again as we continue fulfilling our destinies. The announcement was surprising not least because the trio had downplayed rumors of a split in the wake of Knowles’ success with Dangerously in Love, although prior plans had called for the members to focus on solo projects at the end of the tour. A performance from the tour was filmed in Atlanta at Philips Arena on July 15, 2005, and the resulting DVD Destiny’s Child Live in Atlanta was released on March 28, 2006. RIAA subsequently certified the DVD as Platinum. To view more of these photos, simply click on the ones on top. – There were no additional notes for this tour.